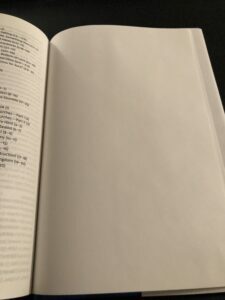 Note: Thomas Nelson provided two copies of the Wiersbe Study Bible, one hardcover and one black leathersoft, free of charge in exchange for an honest review. My opinions are my own. 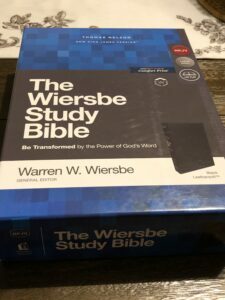 Dr. Wiersbe’s top-quality Scriptural instruction is now available all in one place with The NKJV Wiersbe Study Bible! 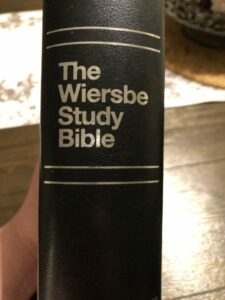 Dr. Wiersbe has impacted millions of people with God’s Word through his “Back to the Bible” radio ministry, and insightful “Be Series” commentaries. Now the wealth of Dr. Wiersbe’s solid Biblical guidance is presented as helpful commentary alongside the text of the Bible itself. 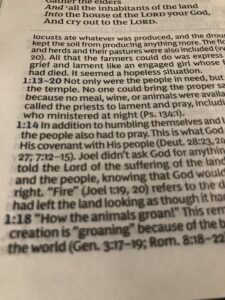 Grow deeper in your knowledge of God’s Word with The NKJV Wiersbe Study Bible. Dr. Wiersbe was the former pastor of the Moody Memorial Church in Chicago and general director of the Back to the Bible radio broadcast for 10 years. He was also awarded a Gold Medallion Lifetime Achievement Award by the Evangelical Christian Publishers Association. 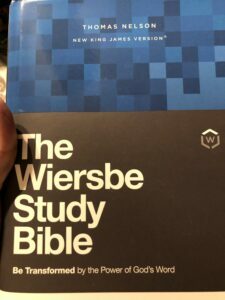 The Wiersbe Study Bible is offered in the New King James Version of the Bible, the 1982 update/revision to the King James Version. 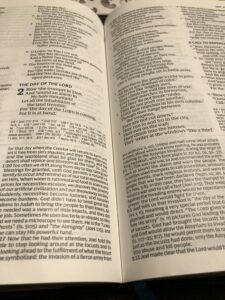 It is one of three major translations that use the Textus Receptus New Testament. 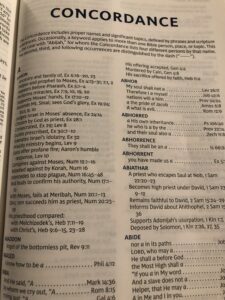 It is one of my two most used translations with over 1000 lessons, personal counseling sessions, and hospital visitations being completed out of the New King James Version. It is fastidiously literal yet still beautiful to read, much like its predecessor. 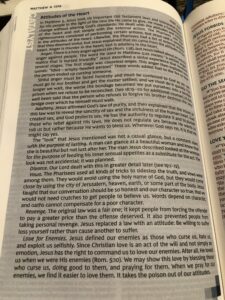 The NKJV is an excellent choice not only for any pulpit but also for Christians at every level of maturity. 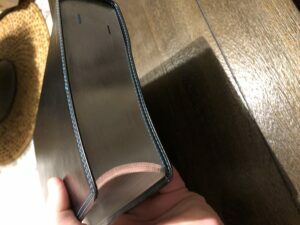 This Bible is available in three covers, all with a sewn binding: hardcover, leathersoft/imitation leather, and genuine leather. The genuine leather feels like calfskin although it is not specified. 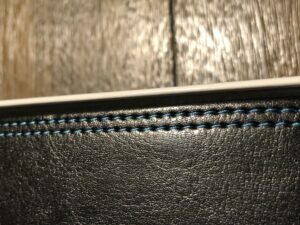 The leathersoft/imitation leather is very convincing and if you did not know it was imitation, you would be certain you were handling real leather. We are presented with a double column paragraph format. There are no center-column references. Instead, Nelson has borrowed from Crossway and placed the references at the bottom of the 2ndcolumn. 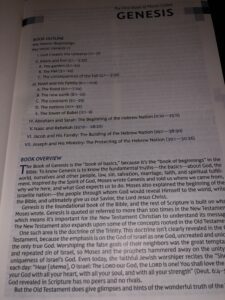 Like the Bible text, the notes are in a double column format. The font is Nelson’s 10.5 Comfort Print in a red-letter edition. Nelson has really stepped up their game on red-letter editions and this one is very crisp, clear, and consistent. Many times you will find a pinkish hue in the “red-letter” edition but you do not have that trouble here. I find the paper a little thin but the opacity was a pleasant surprise; I was actually expecting more show through than what you really get. 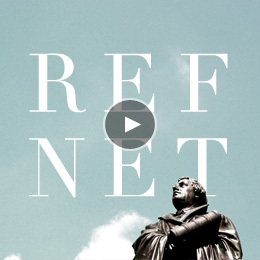 Catalyst Notes:are more in-depth discussions of particular Bible themes and character issues to help you to be transformed by the Scripture. 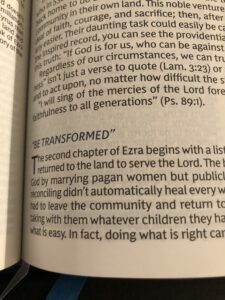 Be Transformed: This showcases the life transforming impact of particular portions of Scripture. 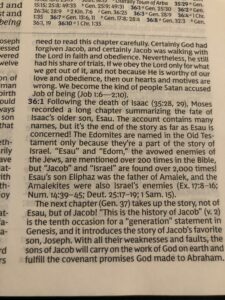 8,000 Expository Notes: The notes provided give you a basic explanation of the Scripture. 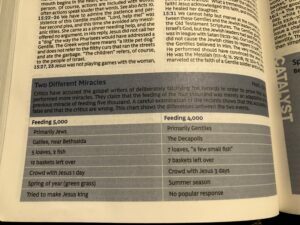 Who is this Bible’s target audience? 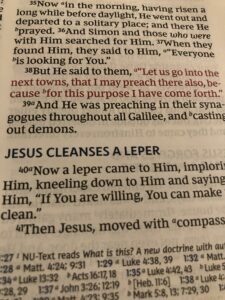 The Wiersbe Study Bible is geared toward two groups primarily: the New Bible Expositor and the New Disciple. 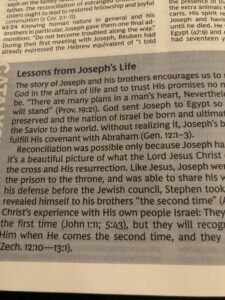 For the new expositor, the helps will guide into lesson prep with beginning materials to deep dive into. 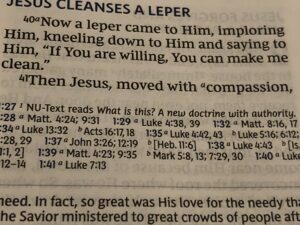 For the new disciple, the helps will provide a solid overview of the Bible. The text is a smidge crowded for me but I do like it. 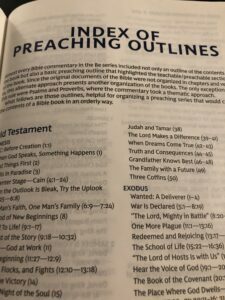 Dr. Wiersbe is one of the top Bible teachers of our generation and I love that fact that a whole new generation of Christians will be able to benefit from his teaching.